From the Baloch nightmare to the British "Guantanamo"
"Did you know where Balochistan is the first day you came to this court?” I asked the jury. “Now you know where it is, and what’s happening to our people there.” Read the article here. 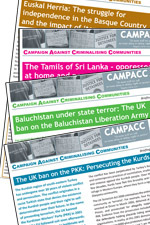 A meeting hosted and chaired by Baroness Helena Kennedy QC with speakers to include: Gareth Peirce, human rights lawyer; Hyrbyair Marri; Faiz Baluch; Peter Tatchell, human rights campaigner.